3 – 8 December 2017 — UN-Habitat and the Lincoln Institute of Land Policy, in collaboration with the Municipality of Belo Horizonte, Brazil, organised the 16th edition of the Latin American Training Programme on Informal Land Markets and Informal Settlement Regularisation. This popular programme is offered annually since 2004 and has always attracted large numbers of experts, senior decision makers, politicians and researchers from various countries of Latin America and the Caribbean. The training programme took place during the period from 3 to 8 December 2017 and is offered in Spanish. Every year the programme is offered in a different city in Latin American and the Caribbean, and is strongly connected to ongoing programmes and policy debates occurring in the host city. The programme is coordinated by Martim Smolka, Director of the Latin American and Caribbean Programme of the Lincoln Institute of Land Policy and Claudio Acioly, Head of Capacity Building of UN-Habitat. 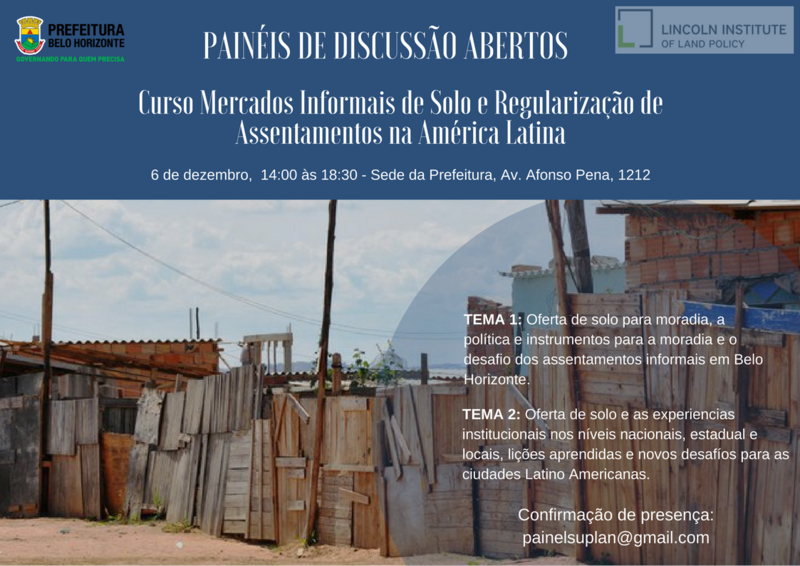 The programme is financed by the Lincoln Institute of Land Policy and brings together a number of prominent Latin American lecturers and scholars. It pays attention to the economics of land markets and informality, housing policies and land use regulations, and makes a critical look at informal settlements regularisation and slum upgrading programmes that have gone to scale. It offers a set of methodological and analytical tools for participants to acquire an in-depth knowledge about the determinants of informal land markets and the phenomenon of informal urbanisation in order to be able to design preventive policies and approaches. Slums of Hope or Slums of Despair?